1. Lightly sauté onion, bacon and mushrooms in a saucepan, then add minced beef, breaking up the meat until cooked through. 2. Add a couple of tablespoons of soy sauce, a couple more of Worcestershire sauce, then simmer for ten minutes, stirring occasionally. 3. Meanwhile, cook the macaroni al dente and drain thoroughly. 4. Spoon a layer of the macaroni into a deep casserole dish, then add a layer of the meat mixture on top – repeat until all of the macaroni and meat mixture is used. 5. 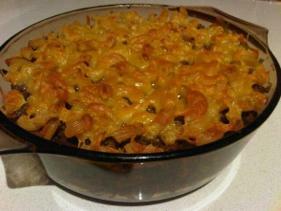 Top with shredded cheese and pop it into a moderate oven until the cheese is golden brown. Serve with a winter salad of lightly dressed green beans and cherry tomatoes, like this one from Bill Granger. Why? Comforting winter food that's quick and easy to prepare.